A Zebra MusselCourtesy USGSInvasive species are getting to be more and more in the news lately, both nationally. Emerald ash borers, Eurasian watermilfoil, Asian lady beetles, zebra mussels, buckthorn and silver carp, just to name a very few, pose significant environmental and economic risks. But, they are a fact of life now, sadly, and its up to all of us to make sure we slow their inevitable spread as much as possible. 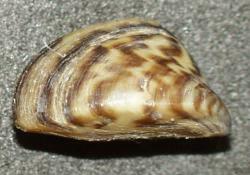 Zebra mussels have been recently discovered in four more Minnesota lakes – Lake Prior (Scott County), Pike Lake (near Duluth), Le Homme Dieu (Alexandria) and Rebecca (near Hastings) bringing the total number of lakes confirmed with zebra mussels in Minnesota up to 10. Eurasian watermilfoil is gaining ground too, recently discovered in Lake Florida, near Spicer. As a result of the spread of these invasive species, the Minnesota DNR is stepping up its enforcement efforts. And while the DNR is doing its best, the message they want to get out is that its really up to everyone who spends time on a lake to stop their spread. On a side note, the Cambridge Field Research Laboratory for the New York State Museum is researching a way to kill zebra mussels with natural bacteria. The bacteria treatment has to date not been tested in a lake, but has been successfully tested in water intakes at power plants. Once the treatment gets EPA approval, it will be tested in lakes, probably in a year or so. 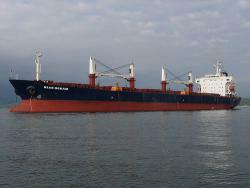 Cargo ships carry invasive species in ballst waterCourtesy AviatorDave A recently released report warns that the Great Lakes have been invaded by foreign aquatic species resulting in ecological and environmental damage amounting to hundreds of millions of dollars. The findings support the need for detection and monitoring efforts at those ports believed to be at greatest risk. The report identified 30 nonnative species that pose a medium or high risk of reaching the lakes and 28 others that already have a foothold and could disperse widely. One preventive measure that works 99% of the time is to flush out the ballast tanks with salty sea water. 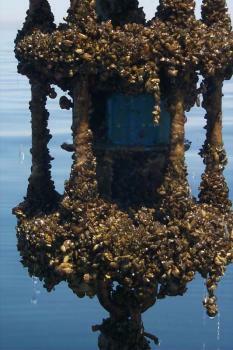 This usually kills any foreign marine life hitch hiking a ride in the ballast tank water. Both Canada and the United States have made this a requirement for almost two decades now. Both nations also recently have ordered them to rinse empty tanks with seawater in hopes of killing organisms lurking in residual pools on the bottom. 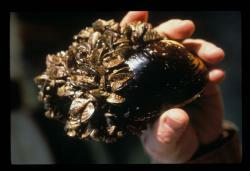 Mussel control: A swarm of zebra mussels have attached themselves to this larger regular mussel. The invasive species has been spreading across the U.S. and have now shown up in three Ramsey County lakes, part of many east-metro area drinking water supplies. But their pressence doesn't impact the drinkability of the water. (Photo courtesy of the U.S. Fish and Wildlife Service)I would have expected this from television news, but this was actually a breaking news story on the Star Tribune website today: zebra mussels have been found in three local lakes that provide water to municipal drinking water systems to east metro cities. A little further into the piece, it does remind us that zebra mussels do not affect the quality of drinking water. The only significant public health issue, I guess, is that the mussels can congregate around and clog up intake pipes for the water systems. Here’s some other breaking news, from me, about our water supplies: geese poop in them, huge carp (and assorted other fish) die in them, and lots of other natural but nasty things occur there as well. That’s why we have water treatment plants and add chemicals that help purify our water. What’s distressing is that the spread of zebra mussels is now jumping from the Mississippi River into other local bodies of water where they have no natural predators to control their numbers. And the article barely addresses that issue.